The red wolf of the Southeastern United States is currently considered by most taxonomists as well as the U.S. Fish and Wildlife Service (under the auspices of the Endangered Species Act) to be a species of wolf, Canis rufus, distinct from the gray wolf, Canis lupus . As a unique type of wolf, it is one of the most endangered mammals on the planet. Similar in size to the Mexican wolf (see Part 6: The Mexican Gray Wolf), the red wolf is somewhat smaller than most gray wolves, adults averaging between 50 and 80 lbs (about the size of German shepherd dogs). And like Mexican wolves, red wolves tend to form smaller packs than most other wolves. While there are some significant differences, there are also several parallels between the recent history and current status of these two small wolves in the United States. Both wolves were almost entirely extirpated from the wild and the last few survivors had to be trapped and put into captive breeding programs in order to ensure their survival. And today, both wolves live in the wild only as small, intensely managed populations. Compared to most gray wolves, red wolves have proportionally longer legs, smaller feet, more slender bodies, shorter fur, longer and narrower muzzles, and larger ears. They share some of these features with Mexican wolves, but upon seeing the two wolves (or photos of them), one can readily tell the difference. The shape of the face and larger size of the ears of red wolves are distinctive, as is their coloration, which features a reddish tint especially on the head, around and behind their ears, and on the backs of their legs. While there is some controversy regarding the taxonomic classification of red wolves as a species separate from gray wolves , genetic research has been deemed by most experts to support the distinction since about 1980. As a separate species, the USFWS’s recovery plan for red wolves has goals that are independent of the status of gray wolf populations. It is believed that prior to European settlement red wolves ranged the entire Southeastern United States, from southern New England (at least ) to Florida along the coast and ranging as far west as Indiana in the north and eastern Texas in the south. Exactly how far north they ranged is unknown and wrapped up with the taxonomic issue of precisely what is a red wolf . But regardless of their exact range, red wolves were an apex predator throughout. Today they are limited to an area of 1.7 million acres of public and private land on the Albemarle Peninsula in northeastern North Carolina, where, adapting to the specific ecological conditions (as wolves usually do), they prey mostly on white tailed deer (50% of their diet), raccoons (30%), and rodents (20%) (the latter includes nutria, also known as coypu – a large semi-aquatic rodent which became a pest and threat to natural marshland ecosystems after it was introduced in the early 1900’s from South America). The story of the near extinction of the red wolf shares familiar features with what occurred in the lower 48 states for the gray wolf, especially with regard to human persecution. Like other wolves, red wolves were subject to intense predator control programs and bounties. But the red wolf faced two additional hazards: (1) relatively greater habitat destruction in the more densely settled area of its range; (2) a greater tendency to interbreed with coyotes than most gray wolves. Coyotes did not originally inhabit the eastern US, but for various reasons they manage to better survive the persecutions and conditions created by humans, successfully living and breeding in suburban and even some urban areas. As wolves were eliminated, coyotes stepped in, migrating gradually from west to east . When red wolf population densities decline, it becomes more difficult for lone wolves to find other lone wolves to mate with, and pairings with coyotes increase . As more hybrids populate the dwindling habitat, there is even less space for pure red wolves, an even a greater tendency to interbreed with coyotes, and thus begins a spiral towards genetic extinction. By the late 1960s, the situation for the red wolf was dire. Unlike gray wolves, which still occurred in robust populations in Canada, Alaska, and Russia, the red wolves of the southeastern United States were all there were , and the only red wolves known to exist in the wild were limited to a stretch of swampy, marginal habitat along the Gulf Coast of Louisiana and eastern Texas. After the passage of the Endangered Species Act in 1973, there seemed only one hope to save the red wolf: remove the few remaining wolves from the wild and place them in a captive breeding program. Over 400 animals were trapped between 1974 and 1980, but only 17 were found to be pure red wolves based on morphological characteristics. Fourteen of these wolves were deemed appropriate for the captive breeding program, and in 1980 the red wolf was declared extinct in the wild. The first red wolf litter was born in the breeding program in 1977, and in 1978 the USFWS tried an experimental release of a male-female pair of red wolves on Bulls Island off the South Carolina coast (part of Cape Romain National Wildlife Refuge), where it was hoped that dangers would be minimized. Being the very first attempt to reintroduce into the wild a formerly extinct predator, no one knew the best procedures and whether wolves born in captivity could fend for themselves. But the pioneer wolves managed to survive, and after nine months the experiment was deemed a success. The wolves were then recaptured so the results of the experiment could be analyzed and used to design a more significant and long-term reintroduction. In 1982 the Red Wolf Recovery Plan was developed, which was revised and approved in 1984. Like actively reintroduced wolves in the Southwest and Northern Rocky Mountain regions, red wolves released into the Southeast would be classified as experimental, non-essential populations, allowing more flexible management options under the Endangered Species Act (as would happen later with reintroduced gray wolves in the Southwest and Northern Rocky Mountain regions). The captive breeding program was expanded to include several facilities within the American Zoological Association’s Species Survival Plan and then the search was on to find a site or sites that would be best suited for the survival of red wolves. Due to the human population density of eastern states and the ubiquitousness of coyotes, finding suitable sites was not easy, but in 1984 an opportunity was created when the Prudential Insurance Company donated to public trust 118,000 acres on the Albemarle Peninsula of northeastern North Carolina – becoming the Alligator River National Wildlife Refuge (which has since expanded through land purchases to about 152,000 acres). Containing forests and marshlands (and a military bombing range), with about half the area consisting of pocosin habitat , human population, livestock, and road density were low, prey density was high, and it was hoped that a peninsula could help isolate wolves from expanding coyote populations. A public education program was initiated along with public meetings to facilitate local support. Then, in 1987, four pairs of red wolves were released into the ARNWR. Meanwhile, an acclimation site was established on Bulls Island to facilitate future releases. The island propagation program, where wolves can adjust to conditions similar to the release area while they roam relatively freely, was eventually expanded to include three more islands: Horn Island off the Mississippi coast, and St. Vincent and Cape St. George Islands off the Florida coast (Horn Island has since been dropped because of too much potential for interaction with humans). After the initial release in 1987, developments on the ground proceeded quickly. Within a year a pair of red wolves produced the first litter of pups born in the wild since the species had been declared extinct eight years earlier. In 1989 two pairs of wolves were released at a second reintroduction site in Great Smoky Mountains National Park. In 1991, a second generation of pups was born in ARNWR. In 1992, more wolves were released near the ARNWR, in Pocosin Lakes National Wildlife Refuge, and the first litter of pups was born in GSMNP. In the meantime the Red Wolf Recovery Plan was being revised with input from scientists and stakeholders. Finalized in 1990, the plan included the following goals: At least 220 wolves living in the wild in at least three self-sustaining populations; maintain a population of at least 330 red wolves in the captive breeding program; preserve 80% to 90% of red wolf genetic diversity for 150 years; and maintain a genetic base indefinitely through embryo banking and cryogenics . With a management plan in place and with additional releases of wolves, the population in northeastern North Carolina gradually expanded and by the late 1990s was approaching one hundred wolves. The wolves in the Great Smoky Mountains National Park were not doing so well, however. Most pups were not surviving due to disease, predation, malnutrition and parasites, and many wolves weren’t staying in the park, probably due to low prey density. Of thhirty-seven wolves released into the park between 1992 and 1996, twenty-six had died or had to be removed for straying out of the park. In 1998 the GSMNP Red Wolf reintroduction project was cancelled and the four remaining wolves were removed from the park and relocated to the North Carolina recovery area. As of today (December, 2010), the red wolf restoration area in North Carolina has expanded through federal purchases of land and agreements with private landowners, and consists of about 1.7 million acres on the Albemarle Peninsula and adjoining areas across the Pamlico Sound to the south. The area contains three national wildlife refuges - Alligator River, Pocosin Lakes, and Mattamuskeet - but over 60% of the area is privately owned. The population of red wolves peaked in 2001 at 131, dipped a bit in the mid 2000s to around 114, and now is estimated to be between 110 and 130 wolves (in 26 packs with 11 breeding pairs and at least 9 lone wolves). While the numbers are fairly stable, this is short of the recovery plan goal of at least 220 wolves living in at least three recovery areas, and significant challenges remain for the Red Wolf Recovery Program. The small population living in the wild is constantly subject to the possibility of being wiped out by a hurricane or a disease epidemic. Other serious threats include habitat fragmentation from development of the inner coastal region, human caused mortality, and coyote hybridization. The potential effects on red wolf survivability of a rise in sea-level from climate change are also being studied. Surveys have shown broad public support for red wolf recovery, and conflicts with human interests due to livestock and pet depredation is minimal in the red wolf recovery area. As is the case for gray wolves elsewhere, some hunters think that red wolves pose a threat to the population of white-tailed deer, although there is no evidence to suggest that red wolves have had a significant negative impact on the white-tailed deer population on or around the Albemarle Peninsula . Nevertheless, human attitudes and actions continue to have a major impact on wolf survival. Between 1999 and 2006, gunshot mortality accounted for about 25% of the known causes of red wolf deaths, vehicle collisions accounted for about 16%, legal removal accounted for about 15% , and illegal poisonings/trappings accounted for about 6% . In the last quarter of 2009, six wolves were shot, one was killed by a vehicle, one died of old natural causes, and two died of unknown causes. A similar level of mortality occurred during the last quarter of 2010: two males and six females (three probably died of natural causes, the other five are under investigation).The final quarter of the year is often dangerous for red wolves in North Carolina, as it includes the rifle hunting season for deer. Between four and six gunshot mortalities of red wolves have occurred annually in the quarter since 2005. Some of these may be cases in which hunters mistake red wolves for coyotes (for which there is no closed season in North Carolina), so program managers are conducting hunter education programs, including the distribution of a hunter education card. But wolves are shot outside the hunting season as well. A reward of up to $15,000 is currently being offered for information leading to the arrest and successful prosecution of whoever was responsible for the shooting deaths of two wolves in April, 2010 (funded in part by private organizations and individuals). While human activity is considered a major factor limiting the expansion of the wild red wolf population , the most significant threat to the long-term recovery of red wolves may be coyote hybridization. Coyotes began moving into the recovery area in the 1990s (some were intentionally transported into the region to train fox hunting dogs, and either escaped or were released), and intensive management is in place to keep the two species apart. Wolves and coyotes are monitored and if a coyote is found to be paired with a wolf, the coyote is captured and then either sterilized and radio-collared, or removed. Additionally, the pups in hybrid litters are euthanized. The Red Wolf Species Survival Plan now includes 40 captive breeding facilities with about 178 wolves (as of December 2010). As with the Mexican wolf, pairings are arranged in order to maximize genetic diversity – a challenge since the population is descended from only 14 wolves. A fostering technique has been developed that helps enhance genetic diversity as well as the number of wolves in the wild wherein wolf pups born in captivity are placed with wild wolf parents already rearing a litter. It has been found that the parents accept the introduced pups and raise them as their own. Today, the small population of red wolves in northeastern North Carolina clings to survival under the constant management of wildlife officials, with the vital assistance of a private, non-profit organization called the Red Wolf Coalition. The RWC works to promote public support for red wolf recovery and to foster co-existence between humans and wolves by providing public education programs about the biology, ecology, and value of red wolves, by involving people in the conservation of red wolves, and by bringing economic benefits to the local people of the region. To enhance the latter, the RWC is working to establish a Red Wolf Center which would give people an opportunity to see live red wolves (difficult in the forests of the Southeast) and to learn about them through entertaining, interactive exhibits. A study at Cornell University in 1997 found that 70% of people surveyed in an eight-state region in and around potential red wolf recovery areas would be interested in visiting a recovery area to see or hear red wolves. The authors estimated that the resulting tourism could bring in up to $37.5 million per year for eastern North Carolina and $132.1 million around Great Smoky Mountain National Park . Another study conducted in 2005 by Ursa International for Defender’s of Wildlife documented the large positive impact a Red Wolf Center could have on the economy of the Albemarle Peninsula Region . As with the return of gray wolves to the upper Midwest, the Northern Rockies, and the Southwest regions of the lower 48 states, the return of red wolves to the Southeast can also have ecological consequences. Ecosystems that evolved for millennia are thrown out of balance when the most important apex predator is eliminated. The presence of red wolves likely helps restore a more diverse, historically typical mix of plant and animal species to the landscape. Evidence suggests, for example, that sea turtles (on the island propagation sites) benefit as a result of the pressure wolves put on raccoons. Ground nesting birds are likely to benefit as well. Red wolves may also help reduce crop damage and over-browsing by deer, rabbits, and rodents, and the damage to marshland ecosystems and levee, road, and farm equipment caused by non-native nutria . They may also enhance the health and evolution of white-tailed deer and other prey populations by exerting selection pressure against maladapted and sick individuals (perhaps before they can further spread disease). The smallish “Eastern” wolf originally inhabiting southern Ontario and Quebec and probably northwestern New York, and now only occurring in Algonquin Park in Canada, which are currently most commonly classified as a subspecies of gray wolf (Canis lupus lycaon), are genetically closer and more morphologically similar to red wolves than are other gray wolf subspecies. Some argue that lycaon wolves should be considered a separate species that descended from the common ancestor on the North American continent, and some argue that lycaon and red wolves should together be considered the same species, but in any case morphological and genetic evidence suggests that they are either gray wolves that had some hybridization with red wolves, or they are red wolves (which may be lycaon wolves) that had some hybridization with gray wolves – with a few coyotes possibly thrown into the mix as well (see footnote 4). Yet another theory suggests that the red wolf is merely a hybrid between the gray wolf and the coyote. 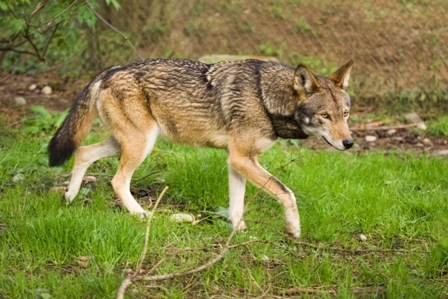 This theory has been used by opponents to try to legally block the recovery program for red wolves, but most experts discount this theory based on recent genetic and morphological research, and on fossil evidence and historical references from the early period of European settlement that establish the long-term existence of red wolves. Some evidence suggests the red wolf may have extended as far northeast as Maine and eastern Canada. Many Eastern coyotes themselves are probably not pure coyotes. One study found that 22% of coyotes in Maine carried at least 50% wolf genes. This is probably why Eastern coyotes tend to be larger than their Western counterparts. It is theorized that coyotes occasionally interbred with wolves as they migrated east. Regarding interbreeding between wolves and coyotes, while there are controversies, some conflicting evidence, and possible exceptions: (1) Cases of interbreeding most often involve a male wolf and a female coyote. (2) The large gray wolves of the Northern Rockies are generally antagonistic towards coyotes and are not known to interbreed with them. (3) Genetic evidence suggests that some Mexican gray wolves have interbred with coyotes on rare occasions. (4) Genetic evidence suggests that some gray wolves in the Western Great Lakes region interbred with coyotes when the wolves of this area declined to very low numbers under strong pressure from humans. (5) The “Eastern wolf” of southern Quebec and southeastern Ontario Canada (Canis lupus lycaon) and the red wolf share some genes and morphological traits with coyotes (especially eastern coyotes, which tend to carry some wolf genes); these wolves will sometimes interbreed with coyotes when they cannot find a wolf to mate with. (6) Gray wolves of the Western Great Lakes Region may occasionally interbreed with lycaon wolves, thus acquiring some coyote genes indirectly. Unless the wolves of the Algonquin Park in Canada are also red wolves – see footnote . Pocosin is a type of wetland with acidic, relatively nutrient poor, sand-peat soils. They are often covered with shrubs and/or pine, cypress, and cedar trees. Much of the Albemarle Peninsula is owned by timber companies and agricultural interests. Data is from , normalized to take out “unknown” causes of wolf losses. The Value of Red Wolf Conservation, compiled by the Red Wolf Coalition. Nowak in Wydeven, A.P., Van Deelen, T.R., Heske, E.J, editors. 2009. Recovery of Gray Wolves in the Great Lakes Region of the United States: An Endangered Species Success Story. Springer Science+Business Media, LLC. © 2010 Alan E. Sparks, author of Dreaming of Wolves: Adventures in the Carpathian Mountains of Transylvania. The author thanks Cornelia Hutt of the Red Wolf Coalition for information and editorial input.